Inductance is a property of an electrical circuit whereby a change in the current flowing through the circuit induces an electromotive force (EMF) that opposes the change in current. In electrical circuits, any electric current ( ) produces a magnetic field around the current-carrying conductor, generating a total magnetic flux ( ) acting on the circuit. This magnetic flux tends to act to oppose changes in the flux by generating a voltage (a back EMF) that counters or tends to reduce the rate of change in the current. The ratio of the magnetic flux to the current is called the self-inductance, which is usually simply referred to as the inductance of the circuit. The property of inductance is particularly noticeable and useful in the form of electrical devices known as inductors. 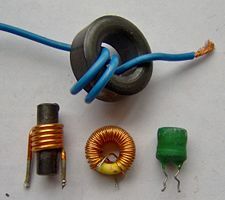 An inductor is often a coil of wire wrapped around a material called the core. When an electric current is passed through the coil, a magnetic field is formed around it, and this field causes the inductor to resist changes in the amount of current passing through it. Inductors have various practical applications. For instance, when combined with capacitors, they are used as chokes in power supplies and to make tuned circuits for radio reception and broadcasting. Also, inductors are employed in transformers for power grids and as energy storage devices in some switched-mode power supplies. The property of inductance is tapped when using electrical devices known as inductors, some of which are shown here. The term 'inductance' was coined by Oliver Heaviside in February 1886. It is customary to use the symbol for inductance, possibly in honor of the physicist Heinrich Lenz. 1 H = 1 weber per ampere (Wb/A). Inductance is a measure of the amount of EMF generated for a unit change in current. For example, an inductor with an inductance of 1 henry produces an EMF of 1 volt when the current through the inductor changes at the rate of 1 ampere per second. According to the above definition, and are the self-inductances of and , respectively. It can be shown (see below) that the other two coefficients are equal: , where is called the mutual inductance of the pair of circuits. The number of turns and occur somewhat asymmetrically in the definition above. But actually always is proportional to the product , and thus the total currents contribute to the flux. for the energy of the magnetic field generated by electrical circuits where is the current in the nth circuit. This equation is an alternative definition of inductance that also applies when the currents are not confined to thin wires so that it is not immediately clear what area is encompassed by the circuit nor how the magnetic flux through the circuit is to be defined. The definition , in contrast, is more direct and more intuitive. It may be shown that the two definitions are equivalent by equating the time derivative of W and the electric power transferred to the system. These equations together state that, for a steady applied voltage v, the current changes in a linear manner, at a rate proportional to the applied voltage, but inversely proportional to the inductance. Conversely, if the current through the inductor is changing at a constant rate, the induced voltage is constant. The effect of inductance can be understood using a single loop of wire as an example. If a voltage is suddenly applied between the ends of the loop of wire, the current must change from zero to non-zero. However, a non-zero current induces a magnetic field by Ampère's law. This change in the magnetic field induces an emf that is in the opposite direction of the change in current. The strength of this emf is proportional to the change in current and the inductance. When these opposing forces are in balance, the result is a current that increases linearly with time where the rate of this change is determined by the applied voltage and the inductance. Since iv is the energy transferred to the system per time it follows that is the energy of the magnetic field generated by the current. The circuit diagram representation of mutually inducting inductors. The two vertical lines between the inductors indicate a solid core that the wires of the inductor are wrapped around. "n:m" shows the ratio between the number of windings of the left inductor to windings of the right inductor. This picture also shows the dot convention. is the mutual inductance, and the subscript specifies the relationship of the voltage induced in coil 2 to the current in coil 1.
is the permeance of the space occupied by the flux. is the inductance of the second coil. is the derivative, with respect to time, of the current through the inductor that is coupled to the first inductor. is the number of turns in the primary inductor. Note that the power through one inductor is the same as the power through the other. Also note that these equations don't work if both transformers are forced (with power sources). When either side of the transformer is a tuned circuit, the amount of mutual inductance between the two windings determines the shape of the frequency response curve. Although no boundaries are defined, this is often referred to as loose-, critical-, and over-coupling. When two tuned circuits are loosely coupled through mutual inductance, the bandwidth will be narrow. As the amount of mutual inductance increases, the bandwidth continues to grow. When the mutual inductance is increased beyond a critical point, the peak in the response curve begins to drop, and the center frequency will be attenuated more strongly than its direct sidebands. This is known as overcoupling. The constant is the permeability of free space (4 × 10-7 H/m), and are the curves spanned by the wires, is the distance between two points. See a derivation of this equation. Here and denote radius and length of the wire, and is a constant that depends on the distribution of the current in the wire: when the current flows in the surface of the wire (skin effect), when the current is homogenuous across the wire. Here is a derivation of this equation. The magnetic field of the two systems coincides (in a half space). The magnetic field energy and the inductance of system B thus are twice as large as that of system A. The self-inductance of many types of electrical circuits can be given in closed form. Examples are listed in the table. The constant is the permeability of free space (4 × 10-7 H/m). For high frequencies the electrical current flows in the conductor surface (skin effect), and depending on the geometry it sometimes is necessary to distinguish low and high frequency inductances. This is the purpose of the constant Y: Y=0 when the current is uniformly distributed over the surface of the wire (skin effect), Y=1/4 when the current is uniformly distributed over the cross section of the wire. In the high frequency case, if conductors approach each other, an additional screening current flows in their surface, and expressions containing Y become invalid. Note that since the permeability of ferromagnetic materials changes with applied magnetic flux, the inductance of a coil with a ferromagnetic core will generally vary with current. ↑ Heaviside, Oliver. 1894. Electrical Papers, p. 271. New York: Macmillan. Retrieved February 23, 2009. ↑ Glenn Elert, Inductance, The Physics Hypertextbook. Retrieved February 23, 2009. ↑ Michael W. Davidson, Electricity and Magnetism Introduction: Inductance, Molecular Expressions. Retrieved February 23, 2009. Grover, Frederick Warren. 1962. Inductance Calculations, Working Formulas and Tables. New York: Dover. OCLC 299921393. Heaviside, Oliver. 1894. Electrical Papers. New York: Macmillan. Hughes, Edward, et al. 2002. Electrical & Electronic Technology, 8th ed. Harlow: Prentice Hall. ISBN 058240519X. Wangsness, Roald K. 1986. Electromagnetic Fields, 2nd ed. New York: Wiley. ISBN 0471811866. Inductance Calculator. The Clemson University Vehicular Electronics Laboratory. This page was last modified on 2 March 2018, at 21:05.